Tartelette: Menu For Hope 6: Call For Prizes! I am honored and thrilled to be the East Coast host for this year Menu For Hope, an annual fundraising campaign hosted by Pim of Chez Pim and a revolving group of food bloggers around the world. Along the years, Menu for Hope has raised nearly a quarter of million dollars in support of the good work of the UN World Food Programme, helping to feed hungry people worldwide. 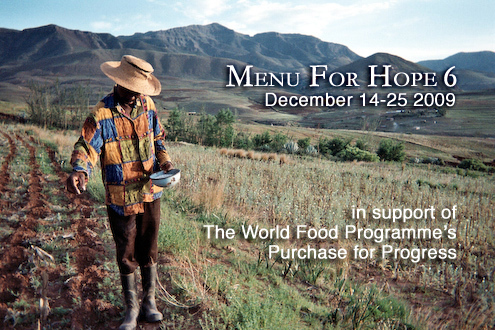 This year, Menu For Hope is supporting a new initiative called Purchase for Progress (P4P). P4P enables smallholder and low-income farmers to supply food to WFP’s global operation. P4P helps farmers improves farming practices and puts more cash directly into their pockets in return for their crops. This will also help local economy by creating jobs and income locally. People from all over the world join the campaign by offering a delectable array of food-related prizes for the Menu for Hope raffle. This year the raffle will start on December 14th and end on December 25th. For every $10 donated, you earn one virtual raffle ticket to bid on a prize of your choice. 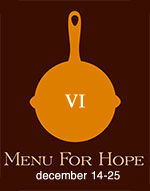 - Participate in Menu for Hope VI by donating a raffle prize or by promoting Menu for Hope on your blog. - The prize you offer need not be of high monetary value, but it should appeal to your readership. A small rule of thumb we'd like to suggest is that each prize offered should have the potential to raise at least $200. - Each donor is also responsible for shipping their prize to the winner so please make sure your budget covers it. It's important that you specify where your shipping area will cover when you offer the prize. No restrictions is always a plus but if you must, then please be very clear in your blog post so as not to confuse our donors. Your host will issue your prize code and give you further instructions on what to do for the Menu For Hope raffle launch on December 14th. Come back to Chez Pim on Monday December 14 when the campaign goes online for a link to the donation site. The raffle is handled by an online fundraising company called First Giving. The bloggers never touch the money. The WFP don't waste overheads on processing mini-donations, the majority of which are between $10-$50, that's a whole lot of tenners to make up $90K. For this year MFH I am donating a one day 101 macarons making class (here in SC unless you are willing to ship me!) and three 8x12 prints from my etsy shop. Details to come next week. What a great event. Glad it is going on again! How fabulous - with all those wonderful bloggers doing the hosting you guys will do a world of good. Feel free to contact Pim to host next year. In the meantime, feel free to talk about the campaign on your blog. Any bit helps!